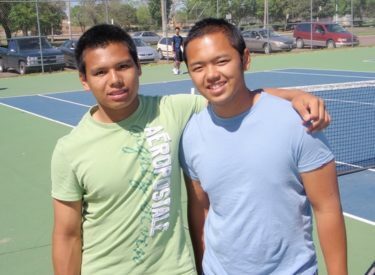 The Redskins send two more Nguyens to the 5-A State Tennis Championship in Emporia this week. Attaining the due respect from other schools in the state, the doubles team of Vince Nguyen and Duc Nguyen qualify for State with a 6th Place finish at Regionals held in Great Bend last Saturday. The top doubles teams in the state were heavily represented at the Great Bend Regional Tournament, but that did not stop the Nguyens from making their mark on school history. Following the fall accomplishments of friend and State medalist, Susan Nguyen, Vince and Duc Nguyen will face the best 5-A talent in Emporia on Friday and Saturday to bring more State tennis medals to Liberal High School. The entire Redskin Tennis Team competed hard and represented their families and school well. 4-6, 3-6 earning the 6th Place Medal and a trip to the 5-A State Tennis Championships in Emporia on Friday, May 14.